Shade Wagon combines an umbrella, seats, cooler and storage in one for easy transport to tailgate or for outdoor sporting events! No more trips back and forth from the event to the car. One trip makes it easy to spend more time with family enjoying the day. 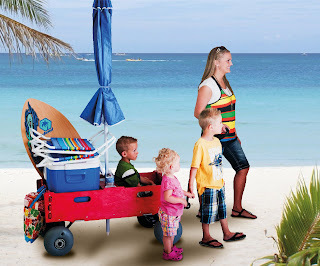 The Shade Wagon was created by two sisters who are also moms that love outdoor activities with their kids. Like most moms, they were tired of the hassle that tends to go along with outdoor events. Tired of arriving an hour early to places like water parks or parades to fight for a spot in the shade. They wanted to arrive and begin the fun immediately. From this desire the Shade Wagon was born! It was a way to bring your shade with you wherever you go. With the wagon acting as the anchor for the umbrella you can stop on any surface, drop your umbrella, unload your wagon, and begin enjoying the day with your family! I own one of these and it is the BEST wagon I've ever had!! Don't think it's just for kids either!